This year we welcome Divya Cherian and Fara Dabhoiwala to the department. Cherian, an assistant professor, is a specialist in early modern South Asian history. Her particular interests focus on the social, cultural and religious history of the region. Dahhoiwala, a Senior Research Scholar, has published on the sexual revolution of eighteenth-century Britain and is now doing research for, among other topics, a global history of English. The department is searching this year in the field of American intellectual history (assistant professor or associate professor level) to complement the successful hiring of an American cultural historian, who will be joining the faculty after completing a two-year combined History and Digital Humanities postdoctoral fellowship at the University of Southern California. Searches for assistant professors in Modern European history, exclusive of Britain, for which we already have leading scholars on the faculty and research staff, and for Imperial China are also ongoing. The latter will culminate in a joint appointment with the department of East Asian Studies. In part the searches respond to imminent losses, the looming retirements of two distinguished tenured members of the faculty: Jan Gross, a historian of twentieth-century Poland, and Benjamin Elman, a scholar of premodern Chinese intellectual history and the history of science. The tenured ranks, however, did increase with the promotion to associate professor of Japanese historian Federico Marcon, who is co-appointed in East Asian Studies and History. Read more. 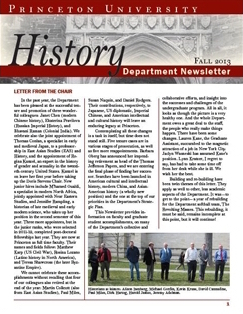 There have been several personnel changes since the last edition of this Newsletter, and there are more changes to come. We have welcomed two new faculty members to the department. One is Assistant Professor Jacob Dlamini, an expert in sub-Saharan African history. The other is Professor Marina Rustow, jointly appointed with the Department of Near Eastern Studies and an expert in medieval Mediterranean history. We have also welcomed Dr. Joseph Fronczak, Associate Research Scholar, who will be teaching courses as a Lecturer on the general theme of the United States and the world. Meanwhile, the staff has seen the addition of a new Manager of the Center for Collaborative History with the appointment of Jennifer Loessy, as well as a new office assistant with the hiring of Heba Jahama. The sad news is the deaths of two distinguished emeriti. Professor Carl Schorske, European political and cultural historian, who specialized in turn-of-the-century Vienna, died at age 100. Professor Charles Gillispie, historian of science whose expertise extended to English and French developments in the eighteenth and nineteenth centuries and beyond, was 97. Read more. 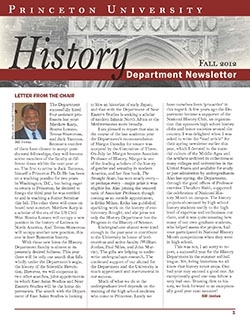 With five tenure decisions, five reappointments, three searches, and several appointments and a promotion on the staff of the Papers of Thomas Jefferson, faculty members in the History Department were fully occupied with personnel matters during the last academic year. The current year promises or seems to promise to be easy in comparison. Happily the decisions we made have strengthened the department immeasurably. 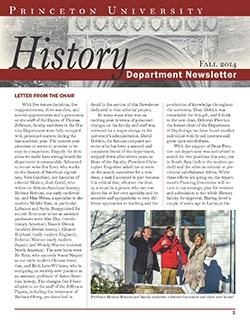 Advanced to tenure were Jon Levy who works on the history of American capitalism; Vera Candiani, our historian of colonial Mexico; Josh Guild, who writes on African-American history; Helmut Reimitz, our early medievalist; and Max Weiss, a specialist in the modern Middle East, in particular Lebanon and Syria. Reappointed for second three-year terms as assistant professors were Alec Dun (revolutionary America), Yaacob Dweck (modern Jewish history), Eleanor Hubbard (early modern England), Federico Marcon (early modern Japan), and Wendy Warren (colonial North America). The new hires were He Bian, who succeeds Susan Naquin as our early modern Chinese historian, and Beth Lew-Williams, who is occupying an entirely new position as an assistant professor of Asian-American history. 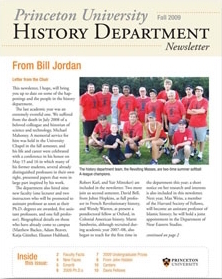 The changes that I have alluded to on the staff of the Jefferson Papers, including the retirement of Barbara Oberg, are described in detail in the section of this Newsletter dedicated to that editorial project. Read more. In the past year, the Department has been pleased at the successful tenure and promotion of three wonderful colleagues: Janet Chen (modern Chinese history), Ekaterina Pravilova (Russian Imperial History), and Bhavani Raman (Colonial India). We celebrate also the joint appointment of Thomas Conlan, a specialist in early and medieval Japan, to a professorship in East Asian Studies (EAS) and History, and the appointment of Regina Kunzel, an expert in the history of gender and sexuality in the twentieth-century United States. Kunzel is on leave her first year before taking up the Doris Stevens Chair. New junior hires include M’hamed Oualdi, a specialist in modern North Africa, jointly appointed with Near Eastern Studies, and Jennifer Rampling, a historian of late medieval and early modern science, who takes up her position in the second semester of this year. Three more appointees, but in the junior ranks, who were selected in 2011-12, completed postdoctoral fellowships last year. They are now at Princeton as full time faculty. Their names and fields follow: Matthew Karp (US Civil War), Rosina Lozano (Latino history in North America), and Teresa Shawcross (the later Byzantine Empire). Read more. The Department successfully hired four assistant professors last year: Matthew Karp, Rosina Lozano, Teresa Shawcross, and Jack Tannous. Because a number of them have chosen to accept postdoctoral fellowships, they will become active members of the faculty at different times within the next year or so. The first to arrive is Jack Tannous, himself a Princeton Ph.D. He has been on a teaching postdoc for two years in Washington, D.C., but being eager to return to Princeton, he decided to forego the third year he was entitled to and is teaching a Junior Seminar this fall. The other three will come on board next summer. Matthew Karp is a scholar of the era of the US Civil War. Rosina Lozano will occupy a new position in the history of Latinos in North America. And Teresa Shawcross will occupy another new position, this one in later Byzantine history. With these new hires, the History Department faculty is almost at its presently desired fullness. This year there will be only one search that falls wholly under the Department's aegis, the history of the Scientific Revolution. However, we will cooperate in two other searches, joint appointments in which East Asian Studies and Near Eastern Studies will be the home departments. Read more. The year since the appearance of the last Newsletter was quite full. 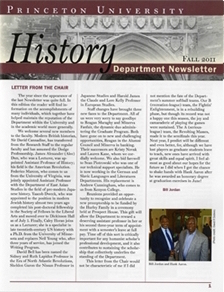 In this edition the reader will find information on the accomplishments of many individuals, which together have helped maintain the reputation of the Department within the University and in the academic world more generally. We welcome several new members to the faculty. Modern British historian, Sir David Cannadine, has transferred from the Research Staff to the regular faculty and has assumed the Dodge Professorship. James Alexander (Alec) Dun, who was a Lecturer, was appointed Assistant Professor of History; his field is the American Revolution. Federico Marcon, who comes to us from the University of Virginia, was jointly appointed Assistant Professor with the Department of East Asian Studies in the field of pre-modern Japanese history. Yaacob Dweck, who was appointed to the position in modern Jewish history almost two years ago completed his postdoctoral fellowship in the Society of Fellows in the Liberal Arts and moved over to Dickinson Hall as of July 1. Finally, Caley Horan joins us as a Lecturer; she is a specialist in late twentieth-century US history with a Ph.D. from the University of Minnesota and replaces Neil Young who, after three years of service, has joined the Writing Program. Read more. We have just begun a new academic year, and I am happy to share with you some of our accomplishments over the last twelve months and our hopes for the future. We have several new faculty members. Alison Isenberg has accepted a position as a professor of United States urban history, and Keith Wailoo joins us in the History of Science Program. Max Weiss, who was offered a position as assistant professor in 2008-09, spent the last academic year at Harvard as a member of its Society of Fellows, but he is on campus now teaching courses in the modern Middle East. Yaacob Dweck, who is in Princeton's own Society of Fellows in the Liberal Arts, has accepted our assistant professorship in modern Jewish history, but will not take up his regular faculty position until after he completes his fellowship in the Society next June. Three of these appointments were made jointly with other academic units in the University (Wailoo's with the Woodrow Wilson School, Weiss's with the Department of Near Eastern Studies, and Dweck's with the Program in Judaic Studies). In all these cases, however, History is designated as the home department; all the offices, for example, are or will be in Dickinson Hall. Read more. 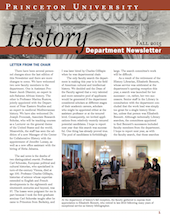 This newsletter, I hope, will bring you up to date on some of the happenings and the people in the history department. The last academic year was an extremely eventful one. We suffered from the death in July 2008 of a beloved colleague and historian of science and technology, Michael Mahoney. A memorial service for him was held in the University Chapel in the fall semester, and his life and career were celebrated with a conference in his honor on May 15 and 16 in which many of his former students, several already distinguished professors in their own right, presented papers that were in large part inspired by his work. The department also hired nine new faculty (one lecturer and two instructors who will be promoted to assistant professor as soon as their Ph.D. degrees are awarded, five assistant professors, and one full professor). 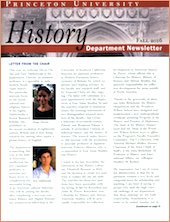 Biographical details on those who have already come to campus (Matthew Backes, Adam Beaver, Katja Günther, Eleanor Hubbard, Robert Karl, and Yair Mintzker) are included in the newsletter. Two more join us second semester, David Bell, from Johns Hopkins, as full professor in French Revolutionary history, and Wendy Warren, at present a postdoctoral fellow at Oxford, in Colonial American history. 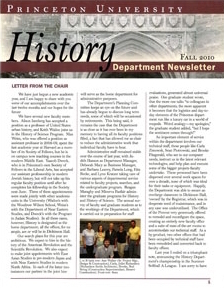 Marni Sandweiss, although recruited during academic year 2007-08, also began to teach for the first time in the department this year; a short notice on her research and interests is also included in this newsletter. Next year, Max Weiss, a member of the Harvard Society of Fellows, will become an assistant professor of Islamic history; he will hold a joint appointment in the Department of Near Eastern Studies. Read more.